Oisín Hurley is one of the smartest, funniest and best looking people in the Eclipse community* So when he says jump, I jump. That's right it is the last day to get your EclipseCon submission for a talk in. If you have been doing anything interesting with BIRT that you would like to share with the Eclipse community, we would love to hear about it. There are lots of opportunities to present at different lengths. Head on over to the EclipseCon submission site and make a proposal about how you are using BIRT. *And totally immune to blatant attempts at flattery. Blackboard, Inc. develops solutions for the K-12 school, college campus, workplace, and community that increase the impact of education by transforming the experience of education. Blackboard has chosen BIRT as its reporting and business intelligence tool. Over the last two years I have been lucky to work with Blackboard on their BIRT integration. Working with their product and developers we have been able to enhance their core product with reports. Each Blackboard report tells a story that can help their clients better perform their jobs. One of BIRT's features that was extremely helpful was the ability to customize and extend BIRT to meet Blackboards requirements. Using the BIRT extension points we added functions and controls to BIRT that improved both the developer and users experience when interacting with BIRT. Blackboard has agreed to release some of the generic portions of this work back to the BIRT community as open source contributions. Rather than rolling these contributions into the core product (where it would quickly get lost amidst all the other code) we have created two small open source projects that can be used by the community. These projects can be used either as fully functional products or as best practice sample code. Uses the Aggregate and Script Function extension point to add new functions to the BIRT product. Uses the ReportItem extension point to create new elements that show up on BIRT reports. Hosts an Eclipse Update site for both projects. We will be adding new projects to this site as we finish up the code. If you would like to find out a bit more about the projects, please visit the project sites. Thanks go out to thank both BIRT Exchange and the brand spanking new Eclipse Marketplace for providing access to our projects. It is really great to have a couple of quality channels to publicize our work to the BIRT community. Also, I want to mention the team that helped to build and get this code open sourced. Steve Schafer from Innovent Solutions wrote a lot of the code and figured out the inner workings of the ReportItem exension point. Blackboard had a whole team of people working on reports, in particular thanks to Heather, JoAnna, Michelle, Dan, Joe, Joel, and Manpreet. A couple of months ago I detailed a new feature for BIRT charts that allows multiple hyperlinks to be attached to one the supported events. That post is available here. In this post I will discuss using a BIRT Text element that contains script which executes within the client browser and contains functions that are called from rendered charts. 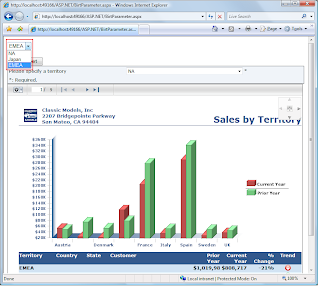 BIRT currently supports interactivity on many chart components like chart series, title, axis, and the legend. The components that support interactivity will depend on the type of chart being used. The events are client based events like mouse click, mouse over, key down, etc. Multiple events can be hooked and each is associated with an action. Actions define the behavior that should occur when a specific event happens. The actions available depend on what component the action is defined for and what chart output type is being used. Currently BIRT supports the following Actions. Hyperlink – Supports multiple hyperlinks, drill through, and linking to bookmarks. Show Toolip – Supports displaying tooltips. Data available for use in the tooltip will depend on the component. Highlight – Highlights the selected component. Most often used to highlight specific series or data point. Toggle Visibility – Toggles the visibility of the selected component. Most often used to change the visibility of a series or data point. Toggle DataPoint Visibility – Toggles the data point label visibility. Invoke Script – Invokes client side script. Additionally if you are using the Chart engine within an SWT, SVG, or Swing based application the engine supports adding a callback action that your code can use to interpret chart events. Highlight, Toggle Visibility, and Toggle DataPoint Visibility actions are only available when using an SVG output setting. If you use SVG, and you wish to test the report in the designer remember to set the Enable SVG chart in the Preview preferences for the Report Design Preference entry. More information on Chart Interactivity is available here. Also see the Chart FAQ for more details. The follow section details an example of using the invokeScript action on multiple Chart events. Assume that you have a Chart that displays a set of customers with a series value for each equal to the customer's credit limit. Suppose you want to display the customer details right below the chart when the mouse is moved over a specific data point. This can be done using the invokeScript action on the mouse over event for the chart series. To do this first create a table below the chart that is bound to the same dataset that the chart is using. You can then nest a table that calls another data set to retrieve customer information. In the attached example this will be the ChartData and CustomerInformation datasets respectively. By default this will generate a inner table that contains customer information for every customer represented in the chart. Obviously you do not want to display all of these at once, so create a new style in the style editor with only one property overridden – Text Block:Display set to no Display. Apply this new style to both the inner and outer tables. If you run the report after completing this step all the tables will be generated in the output but none will be displayed. This is different than using the visibility property which will not put the tables in the output. Enter the following bookmarks for the outer and inner tables. 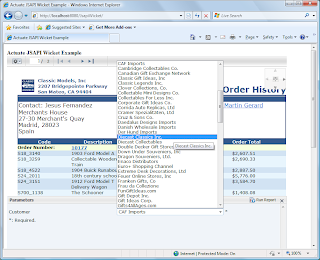 This will assign the outer table id to myoutertable and a unique id for each inner table starting with mytable and the customer number for the given inner table appended to it. We can now use these with some client script to turn them on or off. Add a Text element below the two tables with the following value. Make sure to set the Text type to HTML. The clearSel function first finds the outer table and then locates every nested table and sets the display style for each to none. The outer table’s display style is also set to none. This will effectively hide both tables. 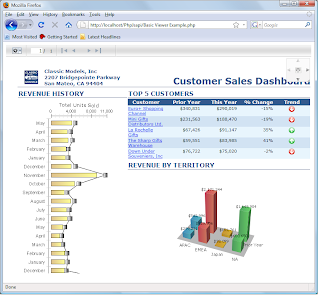 The DisplayCustomer function first clears all current displayed tables. Next it uses a category passed in from the Chart to find the specific customer inner table and sets its display style to block. It also sets the outer table to be visible. To link these two functions to the Chart use the Interactivity button on the Value (Y) Series as shown in the picture below. Note that we use a mouse over event to call the DisplayCustomer function and a mouse click function to clear the tables. The example is available at BIRT Exchange. Starting with the 2.5.2 branch of BIRT (Release date February 2010), configuring the classpath for the designer has been improved. This classpath setting is used by the BIRT engine when processing reports that use Java event handlers or make calls to external classes while in the designer. In previous releases of BIRT, the engine would add all Java projects within the same workspace to the classpath automatically. With BIRT 2.5.2 you will now be able configure the BIRT classpath globally or project specific. This setting is available in the preferences. In this example I have configured a project (BIRT Reports) to add the BirtEventHandlers Java project to the classpath that the BIRT engine uses when previewing the reports in the designer. Note these changes only affect the designer and you should deploy your event handler classes to the scriptlib directory in the deployed environment. More details are available in the bugzilla entry. Recently I have described methods that can be used to access Spring Beans from the BIRT Engine. These examples are intended to be illustrative and not comprehensive. In both of these examples I used the BIRT engine to retrieve Spring objects within the scripting environment. In this post I am supplying an example that illustrates how to implement your own menu in the expression builder, so Spring objects can be called within the BIRT Designer. This will allow you to test your report prior to deployment. I described how to implement the org.eclipse.birt.core.ScriptFunctionService. The attached example is an implementation of this extension point. 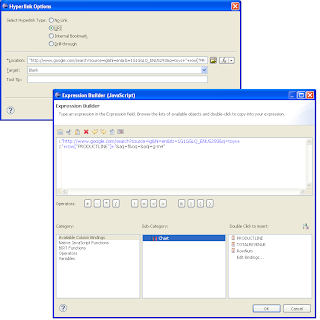 When using this example the expression builder will appear as follows. Provided with the example is a deployable J2EE application and the plugin that implements the ScriptFunctionService. See the readme for details on setting up the example. Also note that the deployable plugin is also attached in the example. You will need to add this to your designer and your runtime. This example works with both the Open Source BIRT designer and the Actuate BIRT designer. Also included is an example report with the following output. This example is available at Birt-Exchange. Movember, that time of year when the days grow shorter, the weather grows colder and the family gathers today for the holidays. Of course in my family the kids are looking at me and laughing, and I am getting 'that' look from Gretchen my wife. Yes I am growing in a mustache in an effort to change the face of men's health. To quote my team lead (I am a part of Team Fat Cyclist). "Movember is the month formerly known as November. During this month, men — manly men — grow mos as a way to call attention to themselves (hey, I’m just being honest here). Then, when people ask you “Why are you growing a moustache?” — and they will ask you this question — you tell them about the cancers affecting men, and ask them to donate to your Mo donation page (the money will be channeled to the Prostate Cancer Foundation and to LiveStrong). So really, a mo is kinda like wearing a pink ribbon for breast cancer awareness. But a lot more personal. And harder to remove. And it’s displayed a lot higher." If you are interested in supporting me and helping to raise money for men's health issues, please visit my mo page and donate. If not me, please visit another great team, the Eclipse Momitters. In my previous post I discussed calling Spring objects within a BIRT report. That example used an architecture similar to the simplified diagram below. The Spring Context was injected in the BIRT app context and this gave the BIRT scripting environment access to the Spring Beans. This example could have been expanded further to the Open Source BIRT Viewer by adding a similar object to the Application Context for the BIRT Viewer. See this wiki page for more details. If you use the method described in the wiki page, you may prefer to implement this with a Spring RequestContextFilter. The simplified architecture for this setup is presented below. Another option is to use Spring Remoting and the Open Source BIRT Viewer tag libraries or standard URL integration. In this case you add the Spring jars to the WEB-INF/lib of the viewer and write a wrapper class for the Spring remote client. The wrapper class and Spring configuration file can then be added to the WEB-INF/lib directory of the Viewer to access your remote beans. The architecture for this setup would be as follows. Attached to this post is an example of this method. 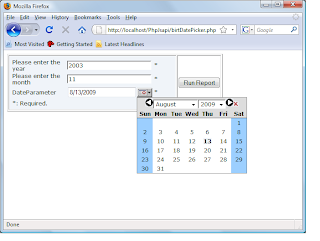 If you are using the Actuate Java Components technology, you can use the JSAPI within a standard HTML page or generate it in a Spring View which will include the BIRT report. This approach allows Flash charts to be populated by Spring Beans and report interactivity like dynamically grouping, sorting and filtering all without re-executing the report. The example, that is attached to this post, is a very simple Spring Remoting example. It contains two ANT projects, one for the server application and one that acts as the remote client wrapper. Once you download the example, build the server application and deploy it. Instructions are in a readme file. Then build the client wrapper jar and deploy it as described in the readme. The readme illustrates deploying to the Open Source BIRT Viewer or the Actuate Interactive Viewer. The example uses Spring HTTP Remoting, but any of the Spring Remoting technologies should work. An example report is provided for both deployed environments. Whether you are using the Open Source BIRT Report designer or the Actuate BIRT Designer, the expression to access the Spring Bean will be similar to the following. Output for the example is as follows. BIRT 2.5.1 was released a couple of weeks ago and with its release BIRT Charts now support multiple hyperlinks. To use this feature select any of the interactivity locations within the chart builder. Next select the add button under the hyperlinks list box. This will launch the hyperlink editor. Enter the name you wish to appear in the context menu. Next select the edit base URL button, which will display the Hyperlink Options editor. Here you have the option to link to a URI, a bookmark within the same report or to a bookmark in another report. Values from the current chart can be passed through to the target. For example the value of a slice could be passed to a google query. To do this select the URI radial and enter an expression similar to the one shown in the image below. When running the report containing the chart, the multiple hyperlinks menu will popup on whatever event you defined in the editor. In the above example this was defined on a mouse click event. So clicking on a slice of the pie will cause the multiple hyperlinks context menu to appear. This sample report is available at Birt-Exchange. In addition to changing the chart using the chart scripting hooks, the chart model can also be changed using the primary BIRT report script hooks. When making changes to the report, most developers will use the beforeFactory event script. This event is fired prior to running the report and offers a location to make simple or complex changes to the report. This includes modifying any charts that exist within the report. Simple chart properties can be changed using the Chart Simple API. An example of this approach is described here. First import the API packages that will be needed. 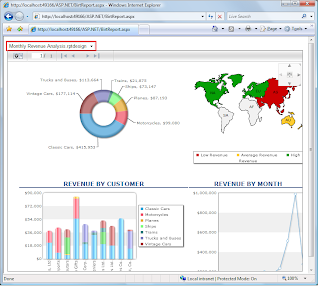 Retrieve the report design handle and find the chart. Note that the chart needs to be named. This can be done in the general properties for the chart. Next retrieve the axes. In this example the chart has two Y-Axes. The second one contains the series to be modified. Clear all series definitions defined for the second Y-axis. The example report contains a combo parameter that allows the user to select the series type for the second Y-Axis. The parameter is checked and an appropriate series is created. Note that if an area series is created, the background is set to translucent. Create a new series definition and set the appropriate query and series type. Assign the new series definition to the second Y-Axis. The example report also has a Boolean parameter that determines if the chart should be displayed as a study chart. 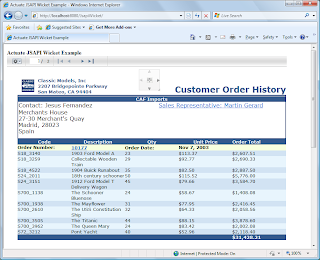 Some of the output options for this example report are displayed below. This report is available at Birt-Exchange. I have written a couple of post on using Actuate’s JSAPI to include BIRT content within your system. This API is AJAX based and allows content to be embedded within most web applications. In addition take a look at calling the BIRT Engine from PHP, which I blogged about a while back. Calling the JSAPI from PHP is not much different than any other front end. For example, including the interactive viewer can be done using the following code. In this example I am setting the JSAPI location and report file to run using a couple of PHP variables. The JSAPI is initialized and the callback function initViewer is called which creates the viewer within the acviewer div element. 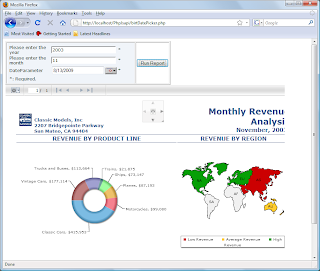 The initViewer function then calls the run method which sets the report to run and executes it. The report is then displayed within the acviewer div element. If the report has parameters you can use the parameter component of the JSAPI or set them using PHP variables. Change the code above to add the parameter values. Next, within the run method set the parameters using code similar to the following. To use the parameter component use code similar to the following. The run function downloads the parameters that were set using the parameter component. Next the setParameterValues method is used to set the parameter values for the run of the report. 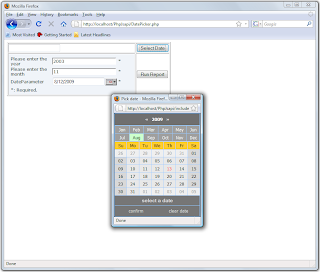 Notice this example has a date parameter, and the JSAPI provides a date picker for this type of parameter. Pursuant to the Eclipse Foundation Bylaws, the Eclipse Foundation recently amended the Eclipse Foundation Bylaws and Membership Agreement. As required by the Eclipse Foundation Membership Agreement, we require your formal acceptance of these changes which became effective July 23, 2008 and are more fully described at: http://www.eclipse.org/membership/vote2008/. Now I have no problem with the changes to the by laws. In fact, they are great for my small company. What I don't understand is why I need to agree in writing to these non-optional requirements? If the decision has all ready been made, why do I need to agree in writing? Maybe it is just me, but it feels heavy handed (and pointless) to insist that I validate a decision after it has all ready been made. After all, if I don't like the decision I can just choose not to renew. A while back I wrote a blog entry about Actuate’s new JSAPI. This API is AJAX based and allows BIRT reports to be displayed using virtually any front end. The previous post points to an article on Birt-Exchange that describes the capabilities of the API. 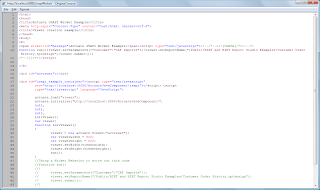 To include the API within an ASP.NET page is very simple. All that is needed is to add a script tag within the head tag and point it to the location you have installed the Actuate Java Component package. The viewer can now be created within any div statement in the page by using code similar to the following. In the above example we are setting the report name based on a drop down list that is populated with the following code. The viewer is created within the “viewer1” div tag. The API also supplies a component for presenting parameters. This component can be created in a similar method to the viewer component. This will present a parameter page that is based on the parameter designs within the report. The Parameter component can be used in conjunction with the Viewer component to display both the parameters and the report within one page. Sets the parameters entered in the parameter component to the viewer component. If you decide to create your own parameter controls, the values can be passed to viewer component using name value pairs. Been busy writing reports lately, but I thought that I would try to publish a few quick tips that I have turned up. One of the issues I have faced is that when a report is being formatted for PDF layout, I want it to be constrained to the page dimensions and to have it in portrait style. At the same time, when it is displayed for HTML, I want to have it in Landscape mode since the rendering seems to be better for HTML. This little section of script placed in the beforeFactory method of the ReportItem will do that for you. BIRT 2.5 M7 was released earlier this month. This milestone adds features like, default parameter value scripting, the ability to paste HTML and RTF directly into a Text element, and independent Locale formatting. Crosstabs have also been improved to support dragging attributes directly from the data cube into the crosstab, independent visibility for a measure and its totals, and improved support for empty values associated with a time dimension. In addition a new interface is provided that allows your Java programs to track the progress of a BIRT report.